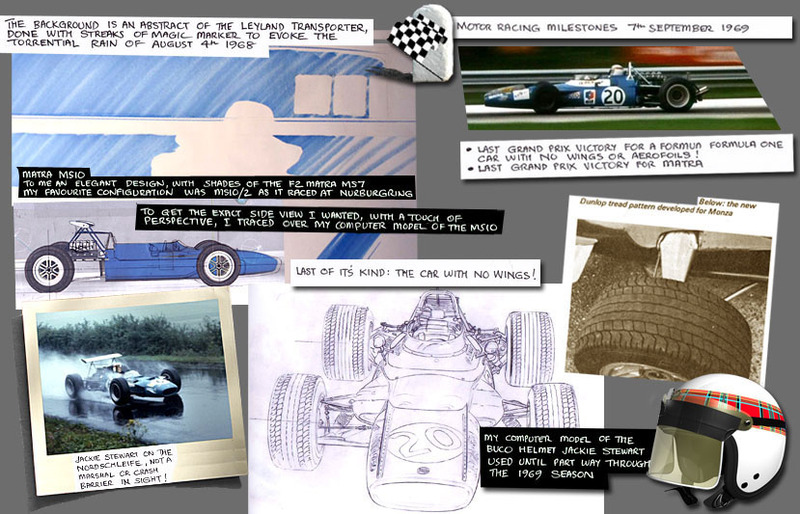 An atmospheric study of the three Grand Prix cars that took Jackie Stewart to his first World Championship. Includes period scenes and a record of which chassis won which Grand Prix. Motor Racing Milestones 7th September 1969 Last grand prix victory for a formula one car with no wings or aerofoils! Last grand prix victory for Matra. Matra MS10 To me an elegant design, with shades of the F2 Matra MS7. My favourite configuration was MS10/2 as it raced at Nurburgring. To get the exact side view I wanted, with a touch of perspective, I traced over my computer model of the MS10. The background is an abstract of the Leyland transporter, done with streaks of magic marker to evoke the torrential rain of August 4th 1968. Jackie Stewart on the Nordschleife, not a marshal or crash barrier in sight! My computer model of the Buco helmet Jackie Stewart used until part way through the 1969 season. Last of it's kind: the F1 car with no wings!